Our latest X-Series Currency Discriminators are now interface with most banks teller App software through ADD-ON Interface products, such as Teller-Count, Teller-Count Base Station, CASH-IN-EZ-Wedge etc. 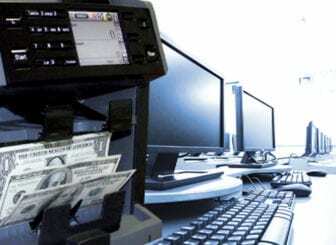 Further, our Laurel K-Series Currency Sorters machines are interfaced with CASHPRO software to transfer currency and Ticket decoding information. For all available software interfacing, please feel free to contact us. “CASHPRO” Software The Accountability You Need… The Process That Makes Sense. CashPro software is your low cost, highly efficient count room management software solution. Interfacing to nearly every slot accounting system and high speed currency counter on the market today, there has never been more flexibility in the count room than with CashPro. Originally developed in 1998, CashPro has been battle-tested and is ready to enhance your count room operations today. CashPro interfaces with most currency counters and sorters —including AMROTEC’s Laurel K4/K8/K-12 Series Multi-Pocket Currency Sorters designed for Casinos to process large volume cash and barcoded tickets in ONE-PASS. Perform critical soft count operations quickly, conveniently and reliably in your casino with CashPro.